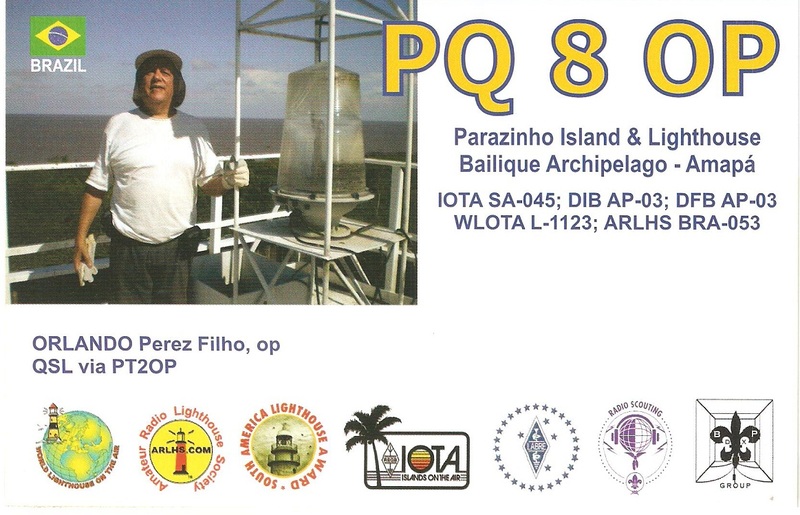 eQSL recebido: PY2NM, Araras, SP, Brasil, 7 MHz, QSO w/ PP6AA (Labre/SE). 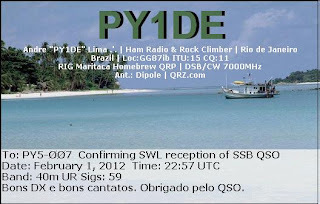 eQSL recebido: PY1VK, Cabo Frio, RJ, Brasil, 7 MHz, QSO w/ PY7AA (Labre/PE). 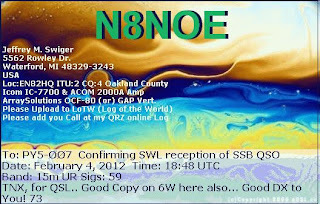 eQSL recebido: N8NOE, Waterford, MI, United States, 21 MHz, QSO w/ 6W1QL. eQSL recebido: PY5AP, Foz do Iguaçu, PR, Brasil, 7 MHz, QSO w/ PY3AA (Labre/RS). eQSL recebido: EC7HC, Pte. 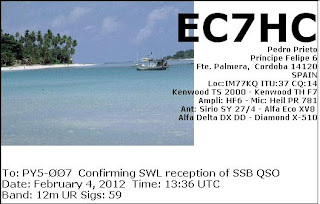 Palmera, Cordoba, Spain, 25 MHz, QSO w/ HK0NA (Malpelo Island). 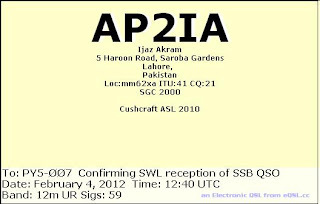 eQSL recebido: AP2IA, Lahore, Pakistan, 25 MHz, QSO w/ EA2CTQ, SQ8JLN, etc. 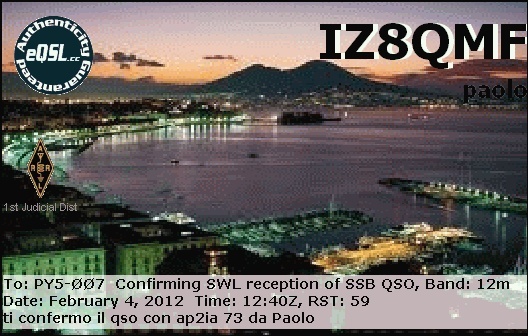 eQSL recebido: IZ8QMF, Marano di Napoli, Italy, 25 MHz, QSO w/ AP2IA. 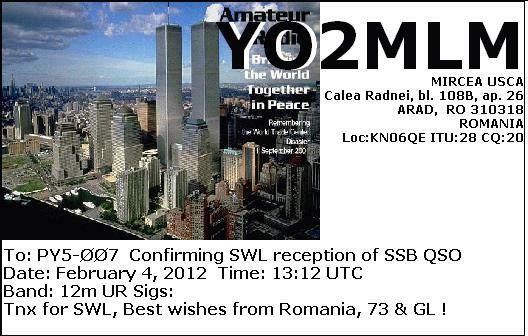 eQSL recebido: YO2MLM, Arad, Romania, 21 MHz, QSO w/ HK0NA (Malpelo Island). 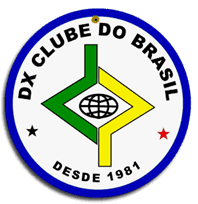 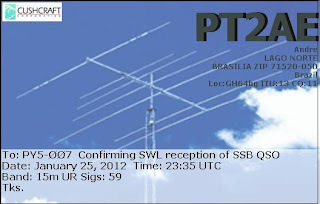 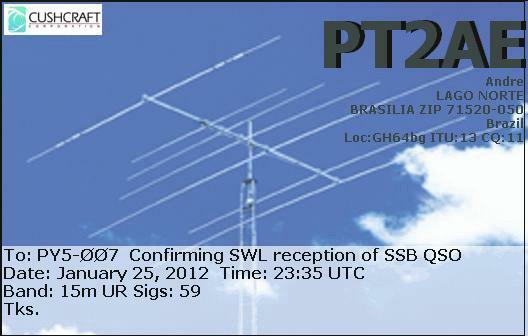 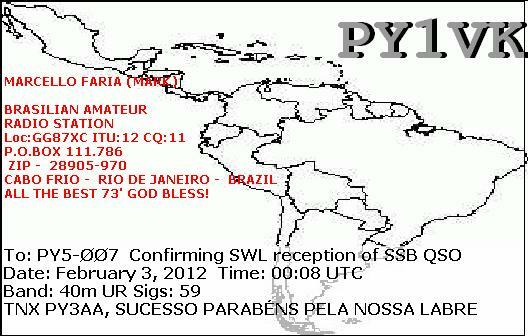 eQSL recebido: PY3IT, Caxias do Sul, RS, Brasil, 7 MHz, QSO w/ PY3AA (Labre/RS). 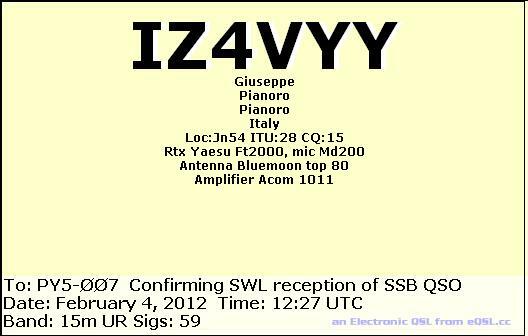 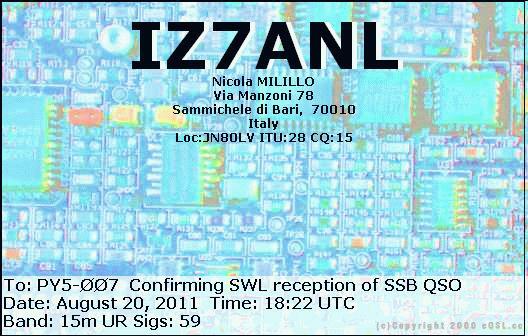 eQSL recebido: IZ4VYY, Pianoro, Italy, 21 MHz, QSO w/ YI1RZ. 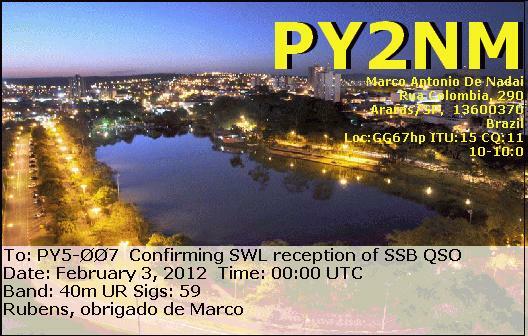 eQSL recebido: PY2NM, Araras, SP, Brasil, 7 MHz, QSO w/ PY3AA (Labre/RS). 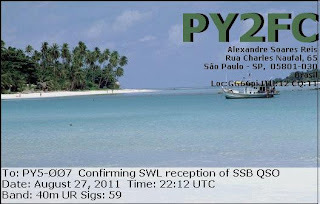 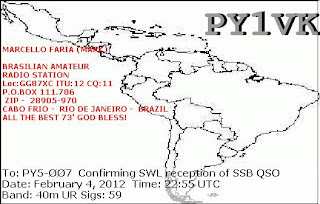 eQSL recebido: PY1VK, Cabo Frio, RJ, Brasil, 7 MHz, QSO w/ PY3AA (Labre/RS). 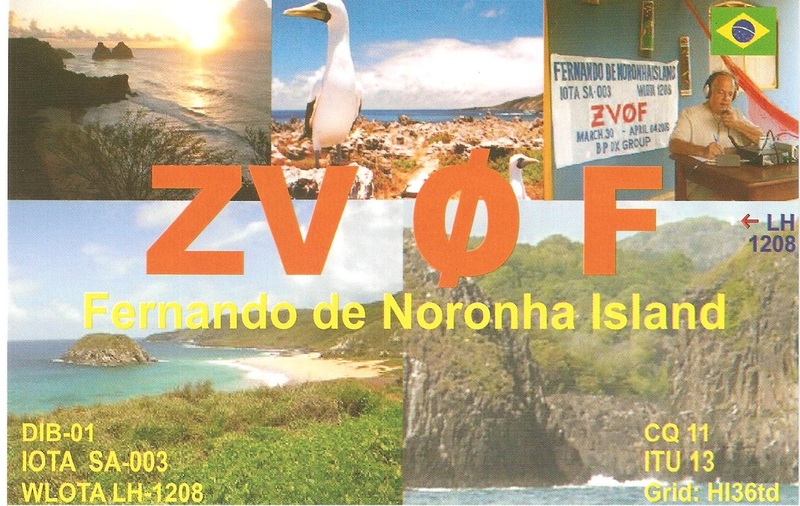 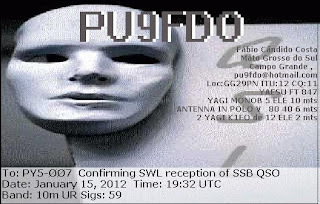 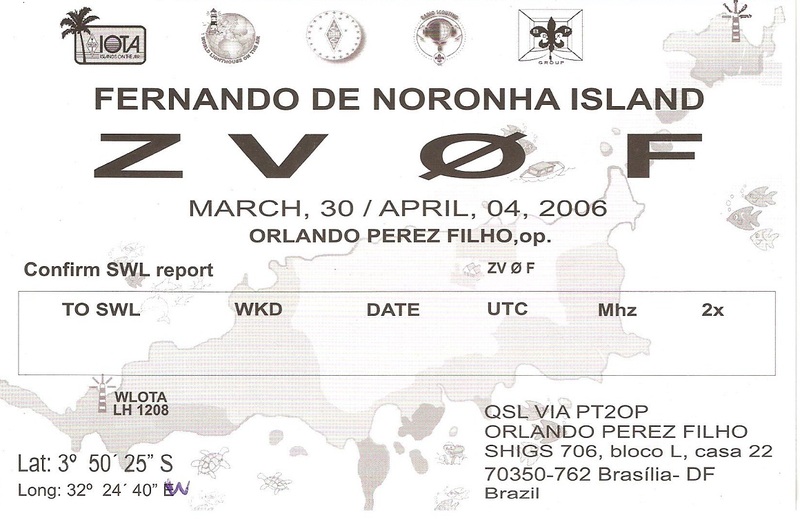 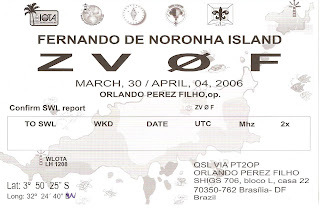 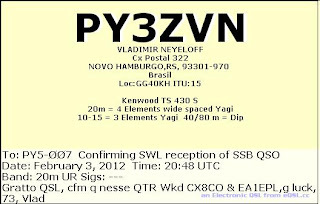 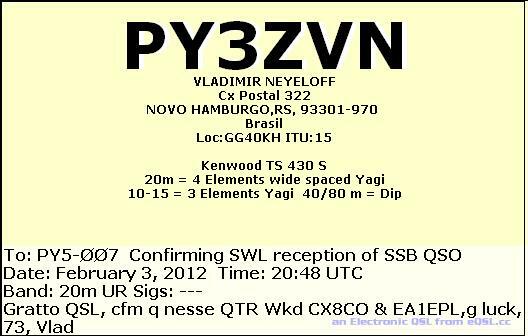 eQSL recebido: PY3ZVN, Novo Hamburgo, RS, Brasil, 14 MHz, QSO w/ CX8CO e EA1EPL. 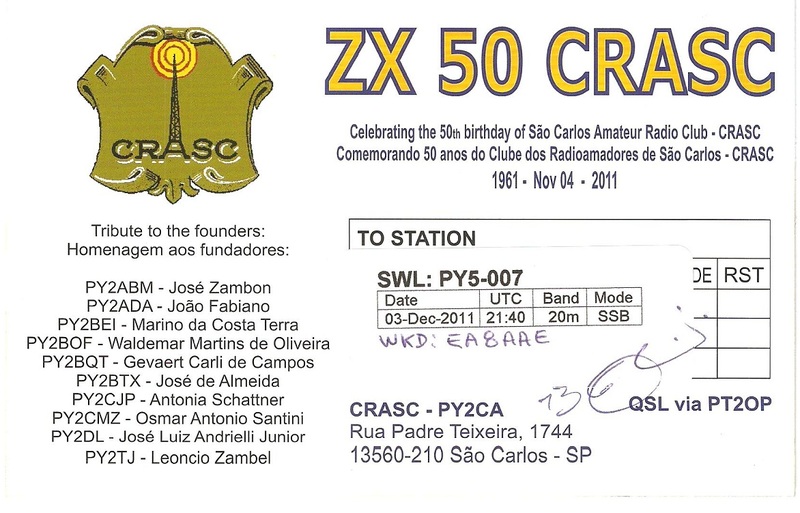 Cartão QSL recebido: ZX50CRASC (Indicativo especial comemorativo dos 50 anos do Rádio Clube de São Carlos/SP), 14 MHz, QSO w/ EA8AAE. 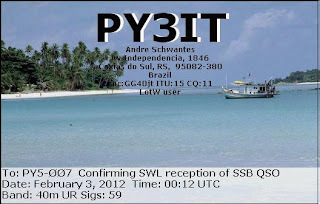 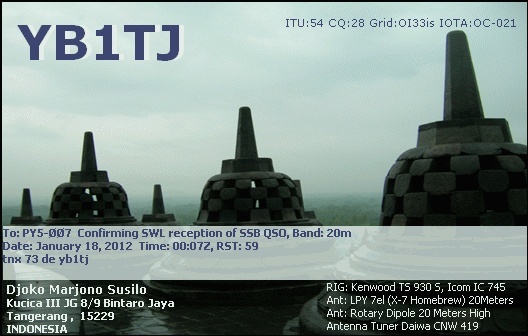 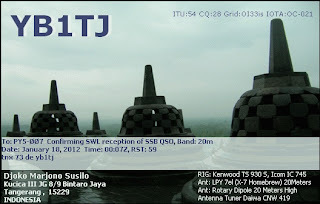 eQSL recebido: YB1TJ, Tangerang, Indonesia, 14 MHz, QSO w/ HK0NA (Malpelo Island). 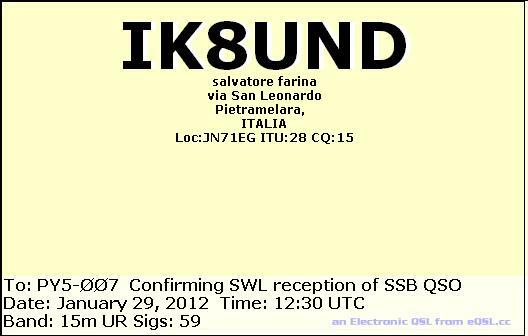 eQSL recebido: IK8UND, Pietramerala, Italy, 21 MHz, QSO w/ ON65BR. 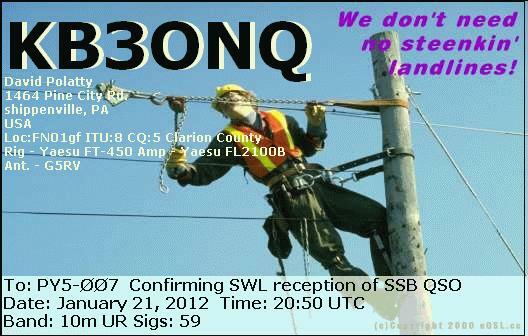 eQSL recebido: KB3ONQ, Shippenville, PA, United States, 28 MHz, QSO w/ VE5ZX. 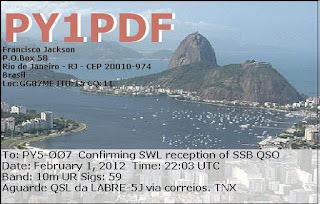 eQSL recebido: PY1PDF, São Gonçalo, RJ, Brasil, 28 MHz, QSO w/ PY1AA (Labre/RJ). 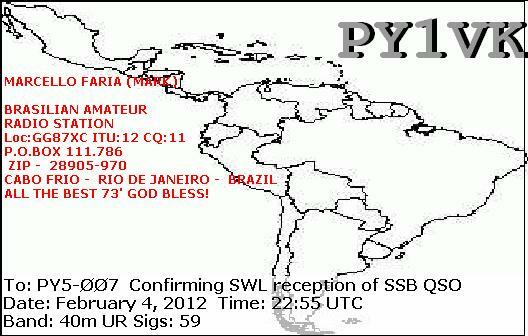 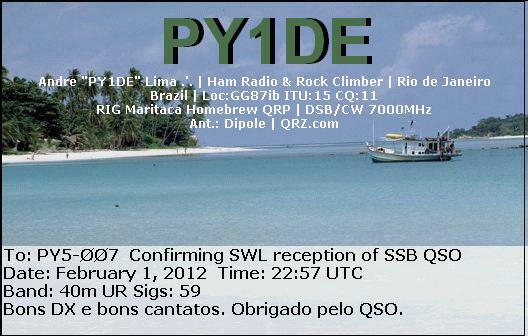 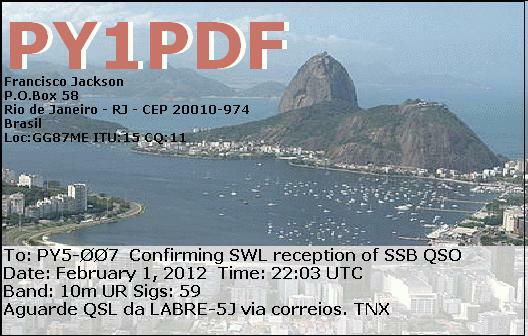 eQSL recebido: PY1DE, Rio de Janeiro, RJ, Brasil, 7 MHz, QSO w/ PY3AA (Labre/RS). 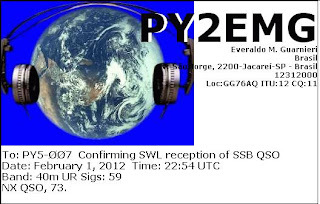 eQSL recebido: PY2EMG, Jacareí, SP, Brasil, 7 MHz, QSO w/ PY3AA (Labre/RS). 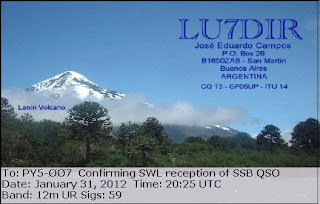 eQSL recebido: LU7DIR, Buenos Aires, República Argentina, 25 MHz, QSO w/ HK0NA (Malpelo Island). 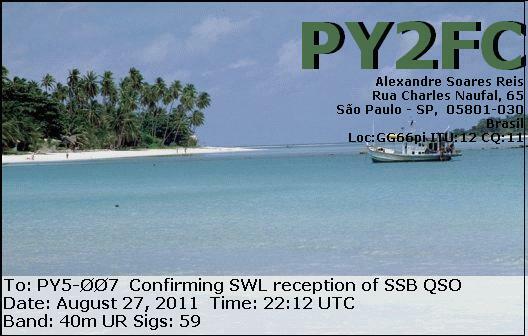 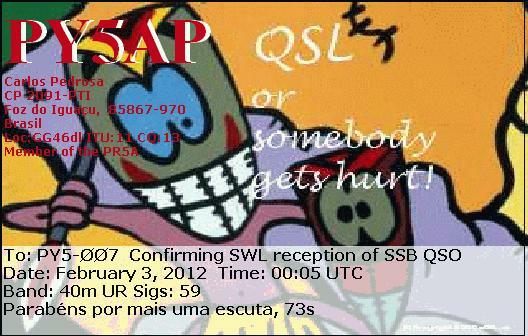 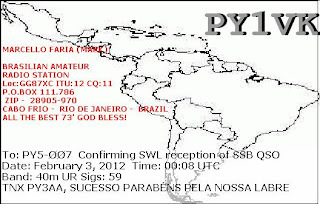 eQSL recebido: PY2COY, Apiaí, SP, Brasil, 14 MHz, QSO w/ 8R1Z. 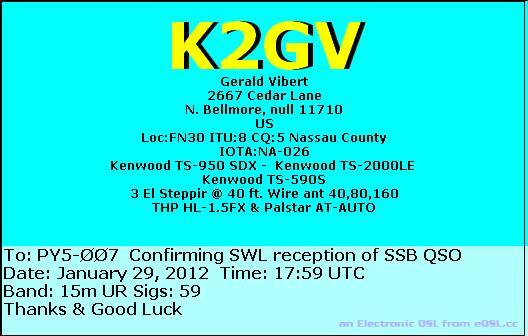 eQSL recebido: K2GV, N. Baltmore, NY, United States, 21 MHz, QSO w/ TN2T. 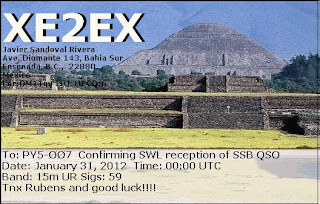 eQSLrecebido: XE2EX, Ensenada, B.C., México, 21 MHz, QSO w/ ZV5AJT. 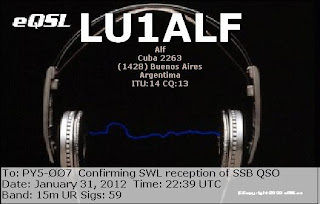 eQSL recebido: LU1ALF, Buenos Aires, República Argentina, 21 MHz, QSO w/ HK0NA (Malpelo Island). 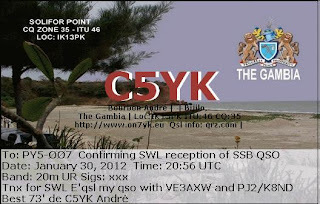 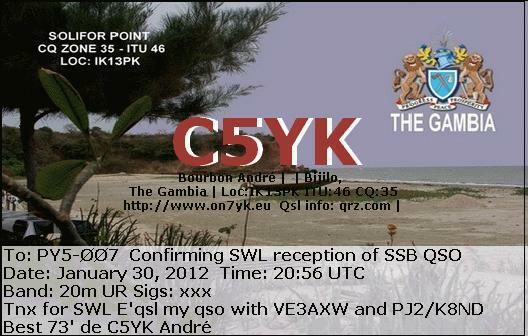 eQSL recebido: C5YK, Bijilo, The Gambia, 14 MHz, QSO w/ VE3AXW, PJ2/K8ND. eQSL recebido: NX7TT, Rigby, ID, United States, 21 MHz, QSO w/ UT7UV. eQSL recebido: N8HSO, Franklin, OH, United States, 21 MHz, QSO w/ TN2T. 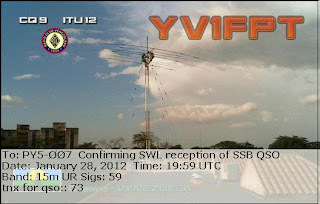 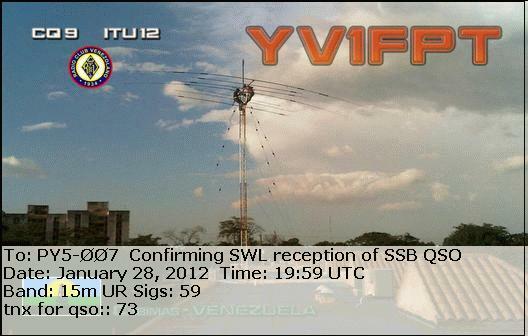 eQSL recebido: YV1FPT, Cabimas, Zulia, Venezuela, 21 MHz, QSO w/ 9Q6CC. It is really a pleasure hearing from you and we do appreciate your writing to us about the reception of our signal. 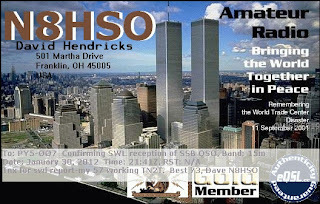 The recording you sent us indeed sounds like calypso music which we carried in a live broadcast on our station, Radio Tambrin 92.7 FM, between 20:00 hrs and 22:30 hrs on Saturday 28th January 2012(Trinidad and Tobago time). The time at your location is 2 hours ahead of ours so that the time of the broadcast is simultaneous with the time that you indicated that you observed the signal. The fact that you could pick us up is truly surprising since our more powerful FM transmitter ( we have two) is just about 4 kW. 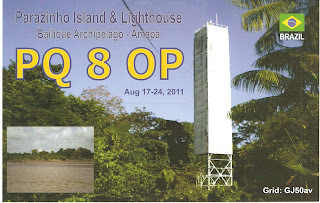 Our radio station is located in Scarborough, Tobago, and we have FM transmitters in Scarborough, Tobago and Couva, Trinidad. Hope you can continue to enjoy hearing us. 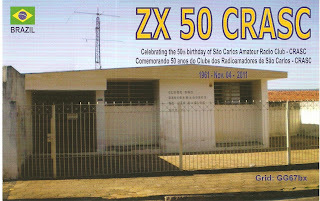 This is our carnival season, maybe we could see you in Tobago for carnival some time. 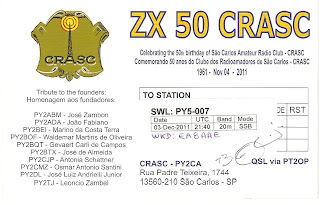 Of course if you cannot pick us up over the air you can get us on our website at tambrintobago.com. Radio Tambrin, 92.7 MHz - Scarborough/Trinidad & Tobago. 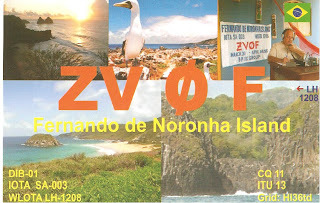 (Rx: Tecsun PL310/Ant: Castelo M6001 - VHF/UHF/FM). 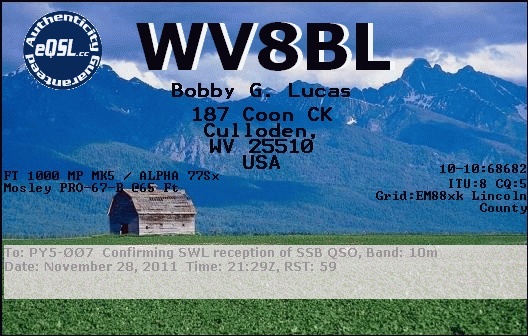 eQSL recebido: WV8BL, Culloden, WV, United States, 28 MHz, QSO w/ 9L0W. 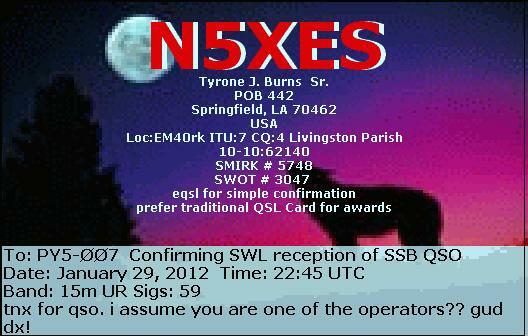 eQSL recebido: N5XES, Springfield, LA, United States, 21 MHz, QSO w/ TN2T. 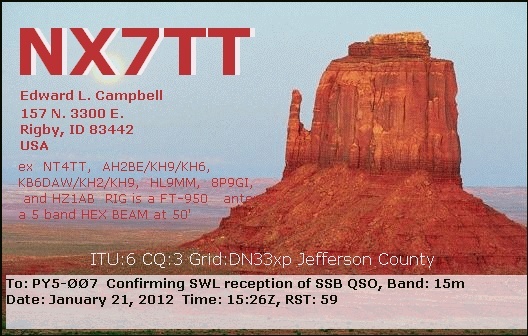 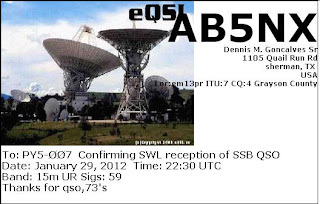 eQSL recebido: AB5NX, Sherman, TX, United States, 21 MHz, QSO w/ TN2T. eQSL recebido: PU9FDO, Campo Grande, MS, Brasil, 25 MHz, QSO w/ HK0NA (Malpelo Island). 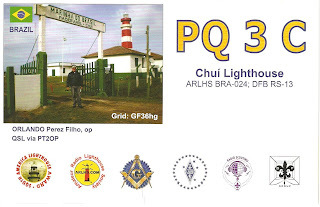 eQSL recebido: PU9FDO, Campo Grande, MS, Brasil, 28 MHz, QSO w/ PP6PP. 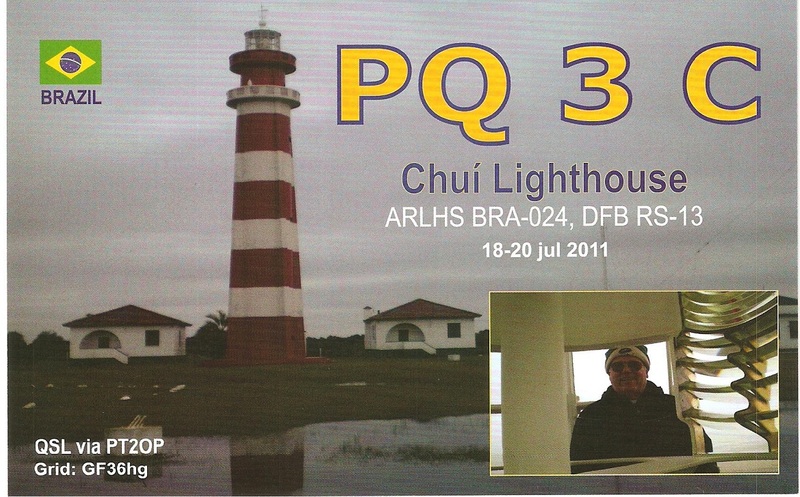 eQSL recebido: PT2AE, Brasília, DF, Brasil, 21 MHz, QSO w/ HK0NA (Malpelo Island). 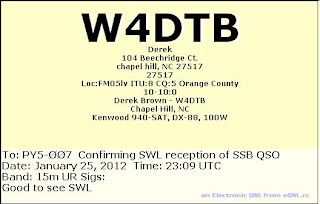 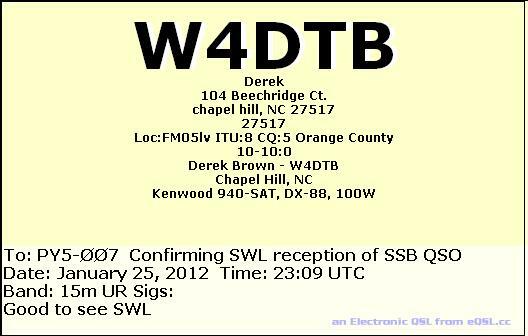 eQSL recebido: W4DTB, Chapel Hill, NC, United States, 21 MHz, QSO w/ HK0NA (Malpelo Island). eQSL recebido: PY2FC, São Paulo, SP, Brasil, 7 MHz, QSO w/ PT2TF/YL (Concurso CVA). 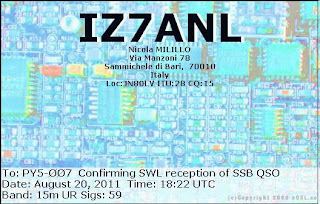 eQSL recebido: IZ7ANL, Sammichele di Bari, Italy, 21 MHz, QSO w/ CW5Z. 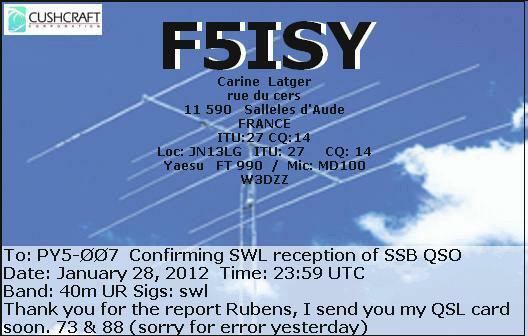 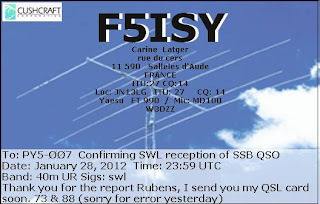 eQSL recebido: F5ISY, Salleles D'Aude, France, 7 MHz, QSO w/ 9Y4LAS.